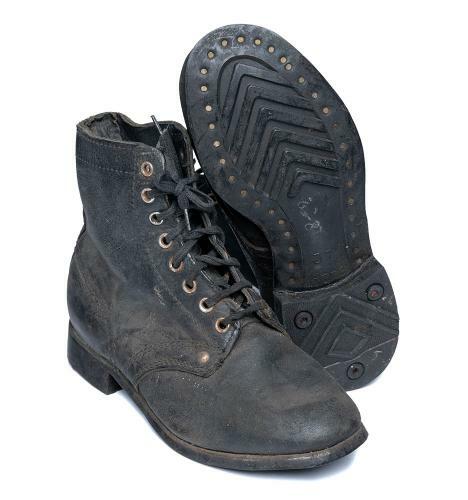 Really old Soviet combat boots. 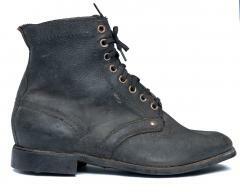 Judging from the rubber sole patterns these probably originate from the 50's, and apart from that tread pattern these are exactly like WW2 era boots. Longer shaft than usual makes these better for use with gaiters or puttees. Good for actual rough use for WW2 re-enactment. Only size 37 (about US 5). Old, used, stored for a looong time. These are dusty and grimey, but some clening and greasing will do wonders. The leather is OK for use but very very stiff. Oil and grease, oil and grease.